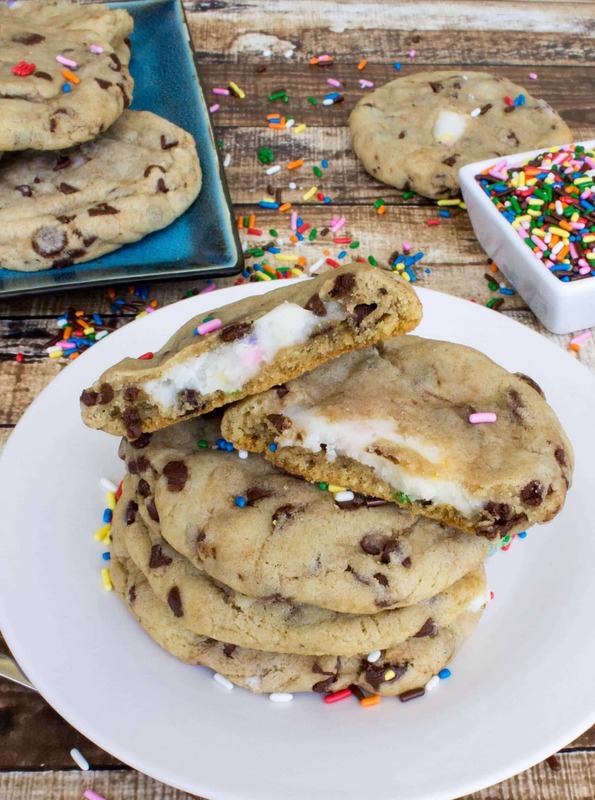 Jumbo-sized soft, classic chocolate chip cookies with a sweet Funfetti filling make for unique Funfetti filled chocolate chip cookies. On Friday, I used one of my many saved vacation days to take the day off work for an extended weekend, and it’s been a frenzied baking whirlwind in my kitchen ever since. My kitchen and oven are exhausted. Over the course of three days, clouds of flour filled the air and a fine dusty layer of powdered sugar settled on every counter top and surface. Smudges of melted chocolate found their way on every drawer handle and crevice of the counter top, and massive, delicately balanced pyramids of dishes repeatedly amassed in my sink and were subjected to cycle after cycle of wash, dry, use, repeat. I created, tried, and tweaked recipe after recipe: pies, dessert bars, cookies, tossing some in the trash and excitedly passing out others to my family members like a pageant queen on a parade float throwing out candy. But of all of the recipes to be perfected in my kitchen this weekend, these cookies are unparalleled in my favor. They are without a doubt, by a long stretch, my (current) favorite cookie, and a quick glance at them should readily reveal why. 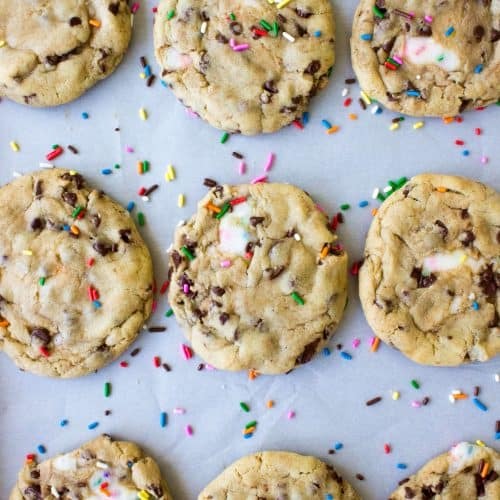 It’s a combination of the fun flavors and colors, (the chocolate chips, the cake batter, the sprinkles!) it is a classic cookie with a fun twist and a colorful (poorly concealed) surprise, and I’m really so excited to share this recipe with you. 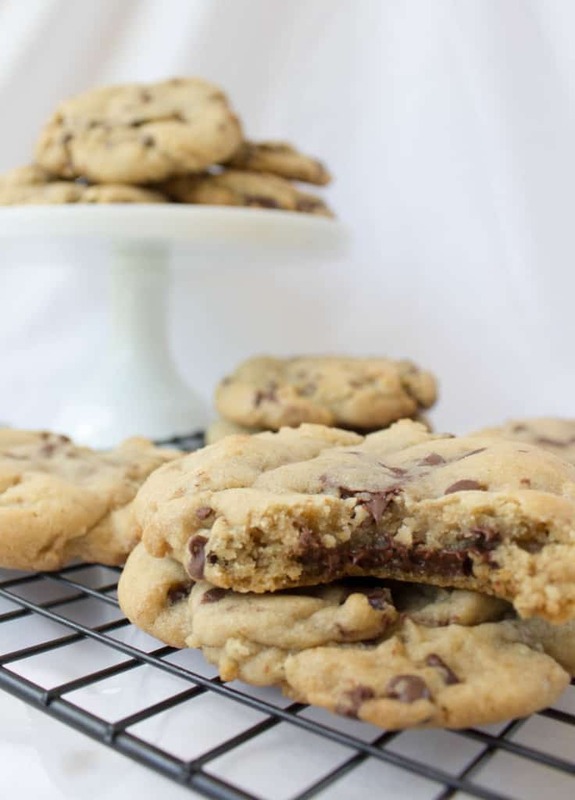 The chocolate chip base turned out so perfectly-flavored and textured that I think it will be my go-to basic chocolate chip recipe for quite some time, slightly crisp on the outside but soft and buttery inside. The Funfetti filling is made to be icing-like, and though it’s not as creamy as standard icing, it definitely has an icing-like taste and softness to its consistency. Zach mentioned to me as I was in the middle of preparing these cookies–our counter tops and floors and dogs covered in a fine dusting of confectioner’s sugar and stray sprinkles–that it seemed like I’ve been making a lot of Funfetti recipes recently, so I hope you’re not tired yet of seeing this signature, sprinkled cake batter pop up on my blog. I try to space recipes that are similar some distance apart, but I really couldn’t make myself wait longer than today before sharing these. 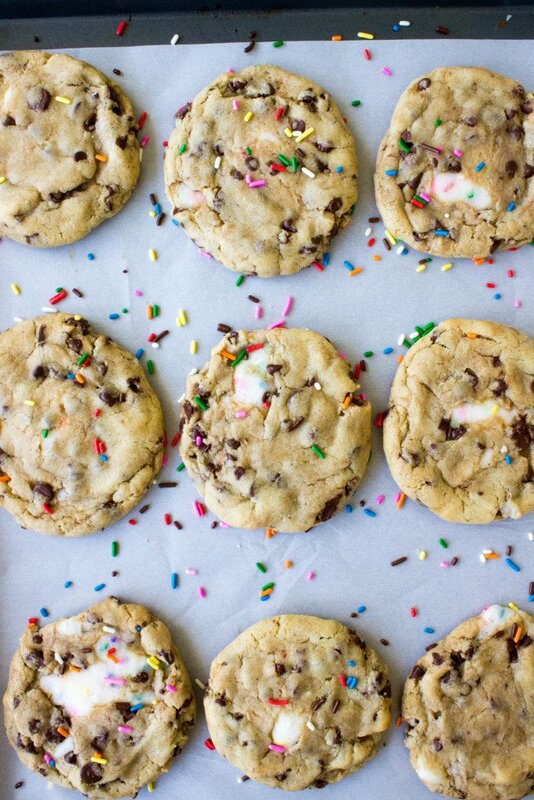 And anyway, really, what better way to start your Monday morning than with sprinkles and chocolate chip cookies? 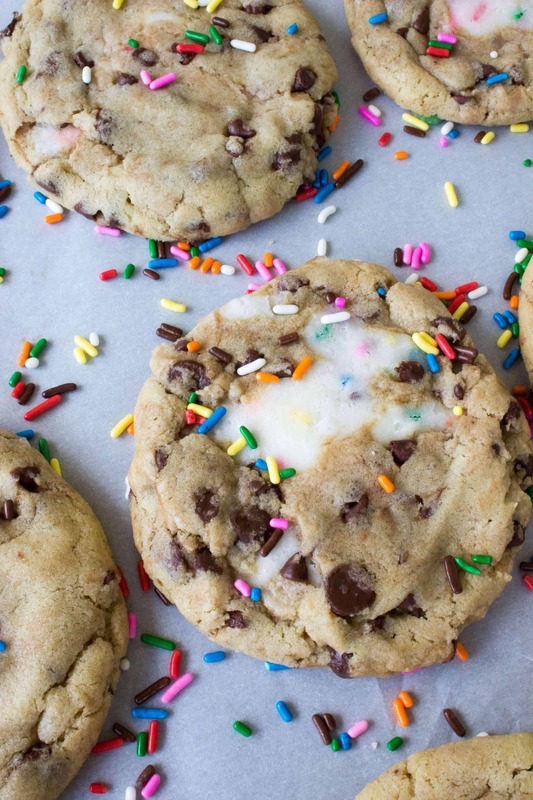 Chocolate Chip Cookies with a Funfetti surprise filling! In KitchenAid, or with hand mixer, cream butter on medium speed. Stir in cake mix and vanilla extract. Add 2 Tbsp of heavy cream and stir well. Gradually stir in powdered sugar, about halfway through stir in the remaining Tbsp of heavy cream or milk. Transfer funfetti mixture to freezer while you prepare the cookie dough. In large bowl, stir together melted butter and sugars. In separate bowl, whisk together flour, cornstarch, baking soda and salt. Gradually stir flour mixture in to butter mixture. 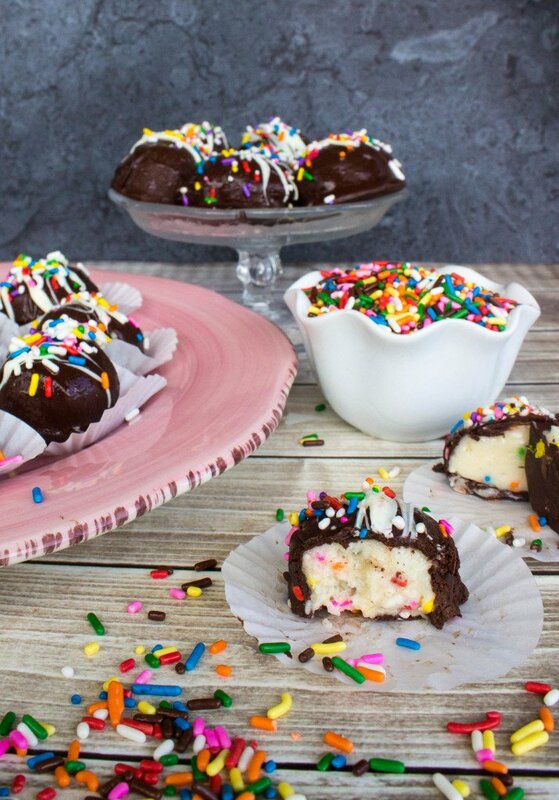 Remove Funfetti mixture from freezer and use a spoon to form 2-3 tsp sized balls. Set on a wax-paper lined plate (should form 24 balls. If the frosting becomes to sticky to manage while you are scooping, return to freezer for 5 minutes before trying again). Remove funfetti filling from freezer and, working quickly, press into cookie dough balls and fold cookie dough around the filling, sealing the funfetti inside completely so it is not visible from outside the cookie (some of the filling will show once the cookies are done baking, but there should be NO filling visible when they go in the oven, otherwise the filling may leak everywhere). Place on parchment paper-lined cookie sheet and gently, slightly press down to lightly flatten (if any filling becomes exposed, seal it up). Repeat until all cookies are sealed around funfetti frosting (you may have some filling left over, that's OK, don't try to cram it all in). Place prepared cookie dough balls in freezer and chill for at least 30 minutes. Once cookies have chilled, place about 2" apart on a cold parchment paper-lined baking sheet. Bake on 375F 13 minutes. Allow to cool completely on baking sheet (cookies are fragile and will break easily when hot). 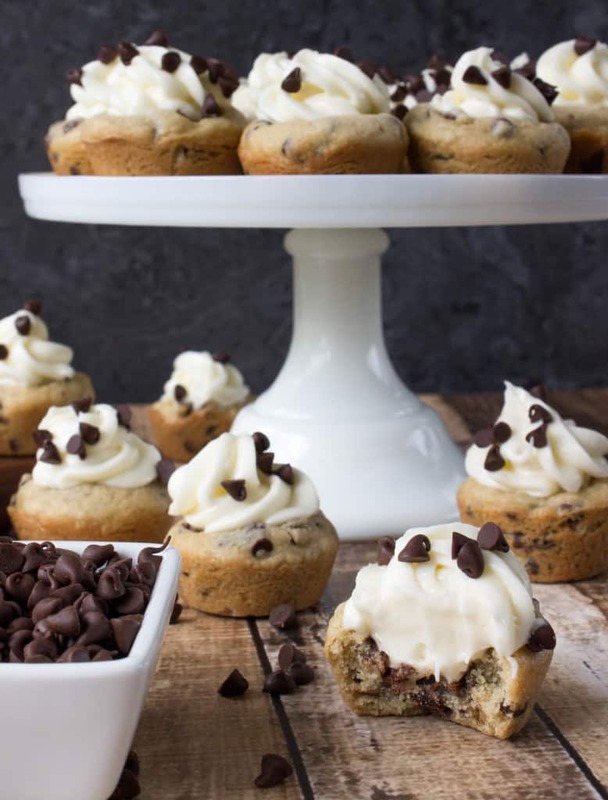 While each batch bakes, keep the waiting cookie dough balls in the freezer. Do not put cookie dough on hot baking sheets or the dough may begin to melt before it can bake, yielding messy cookies. 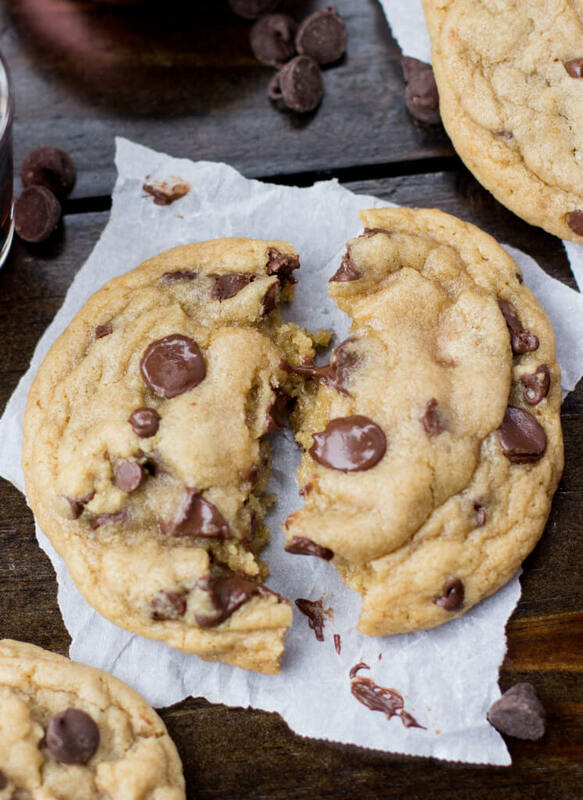 These cookies are absolutely delicious and a fun alternative to traditional chocolate chip cookies. That said, I probably won’t be making them again. I followed the recipe exactly but the cookie dough was such a dry, crumbly mess that it was almost impossible to roll into a ball around the funfetti balls. I had to wet my hands between forming each cookie just to get it to hold together. More than once I wanted to just throw out the whole thing out of frustration. I’m glad I stuck with it because they tasted amazing but were just way too much work. Do you have any ideas about why the dough would have turned out like that? I’m stumped and would otherwise totally make them again. Hi Liz! I’m so glad that you liked the final product! Now, as to why the cookie dough was crumbly, I’m honestly not sure. It’s possible that if the flour was measured incorrectly (for example, if you scoop the flour directly out of a container with the measuring cup instead of spooning it into the measuring cup and then leveling — I’m doing a post about this soon because it’s a common mistake) you could end up using a lot more flour than the recipe actually calls for, resulting in a crumbly dough. If this isn’t the case, I’m honestly not sure why it was like that. However, I’m having my sister troubleshoot these cookies for me at her house as we speak (I’m not doing it myself because I’m worried some of my bias will leak into the process). She’s going to give me step by step feedback on things that may have caused this, and I’ll report back to you. Thanks for commenting, and I’m really glad that the end result was at least enjoyable! I was so excited to make these cookies and all was well until they were baking. I followed your directions exactly, the cookie dough had no holes and no funfetti showed before putting them in the oven. Whilst baking, the cookies ruptured and icing seeped out of all of them, as though they exploded. Thus when I figured they were ready to be taken out, most of them had no filling inside whatsoever so a lot of them crumbled into several large pieces. It’s still a good chocolate chip cookie, definitely, but there’s no funfetti filling in 99% of them. I’m so upset! Hi Bree! I’m so sorry you had this problem! Someone else commented that they had a similar problem, actually, and though I’ve made these cookies plenty of times without issue, I think I’m going to go back and do some intense troubleshooting. I think that it has something to do with the temperature of the butter, and it could probably be fixed by chilling the dough for longer (I’m going to recommend chilling the dough for 30 minutes before putting it in the oven, to be safe), but I will let you know once I make them again what I think the issue may be. Again, sorry that you experienced this!!! When I was baking these cookies I had a few difficulties: the cookie dough was very crumbly (compared to the sticky chocolate chip cookies I typically bake) and did not take well to having funfetti filling stuffed inside. 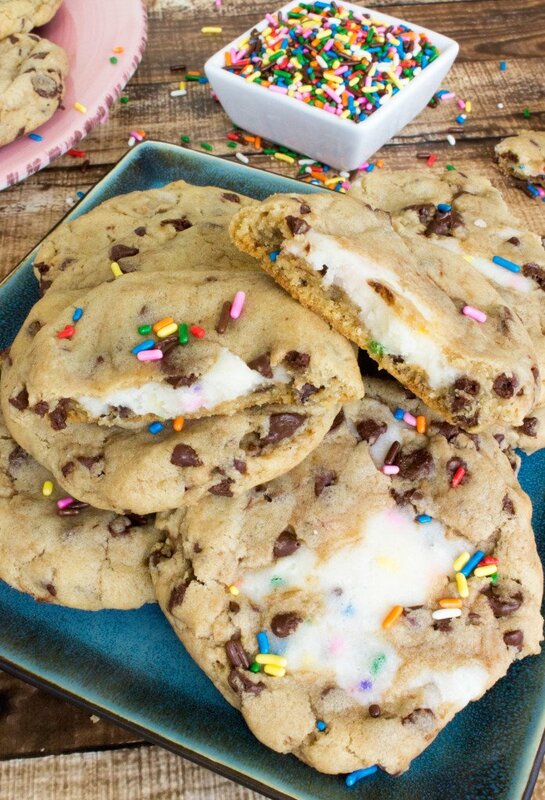 Furthermore, I wasn’t able to get all the funfetti filling inside of the cookie. It was quite a lot. Then again we did make more than 24 cookies. I used a 1/4 cup measure, filled to just before it tapers outwards, but we still ended up with 35 decent sized cookies. Hi Camille! Sorry to hear about the difficulty, I’m not sure why the dough was crumbly; it was a pretty wet, cohesive dough for me due to the melted butter so I’m not sure why you didn’t experience that. I did have a little bit of funfetti filling left over, but not a terribly great amount. Did you measure the cookies before filling with the funfetti? I measured out the dough (about 1/4 cup) and then pressed the Funfetti filling inside and folded the cookie dough around it, and that’s how I ended up with 24 cookies. My best guess would be that your cookie dough balls were smaller than the size I made (though you’ll see that the Funfetti icing does peek through the cookies in the photos, that’s completely expected), though if you used the 1/4 cup measurement it sounds about the same, so I’m puzzled and don’t have a good answer for you right now. I’ve made this recipe a few times with no issue, but I’ll give it another try and see if I can troubleshoot the problems you’ve experienced. tried baking these a couple of times, but the center never looks white like in your pictures. How did you get the funfetti to stay whole during the cooking process? Hi KT, are you using butter or margarine? Margarine can be problematic to the filling holding its shape and could alter the color. I hope this helps, but please let me know if you have any more questions!